Tell any Australian that you’re visiting Canberra and they’ll ask you one question: why? Standard school trip fodder, most Aussies from the eastern seaboard have only experienced the city through the eyes of an 11-year-old, recalling little more than a tedious bus trip and a walk around parliament. Surely enough to put anyone off. That Canberra should hold less allure than other Australian cities isn’t too surprising; it is, after all, a purpose-built political capital. The story goes that in the early 1900s, long-standing rivals Melbourne (Australia’s largest city at the time) and Sydney (the country’s oldest) wrangled over who should win the mantle. Unable to resolve the dispute, Canberra – with its cooler climate and location away from the coast – was the compromise. At just 105 years old, it remains among the youngest capital cities in the world, and has long been dismissed as Sydney and Melbourne’s boring cousin with a stiff upper lip, chock-full of nothing other than museums and monuments. But there’s another, much more frivolous, side evolving: from vegan-friendly doughnut stores that host late-night cocktail parties, to speakeasies hidden below bakeries, a booming micro-brewery scene, kooky fusion restaurants and a contingent of affordable, design-led hotels – it’s even the birthplace of the “freakshake”. And with a new daily service launched by Qatar Airways on February 12, and Singapore Airlines on May 1, the capital has never been easier to reach. Hidden away in an otherwise unremarkable industrial estate, the huge warehouse accommodates stainless steel brewing tanks and a food truck that doles out fries and flame-grilled burgers. At Asian fusion eatery Lazy Su, where cheeseburger spring rolls are the order of the day and boozy bubble tea is on tap, the friendly manager tells a similar story. “We were very much a pub and club kind of place five years ago,” he says, before taking the time to write me a list of local recommendations that includes his favourite regional wineries and the city’s best bars. Locals here often stop and chew the fat with me, even more so than in other state capitals – quite a feat for a country already known for the friendliness of its folks. Lazy Su and Capital Brewing Co are just two examples of Canberra’s cool new wave. The city now lays claim to Australia’s best bar (Bar Rochford, as named by national food and wine magazine Gourmet Traveller); the world’s best co ee (the owner of local cafe micro-chain Ona picked up the title of World’s Best Barista at the 2015 championship); and some of Australia’s best wine (Clonakilla Winery in nearby Murrumbateman is home to one of the country’s most awarded reds). 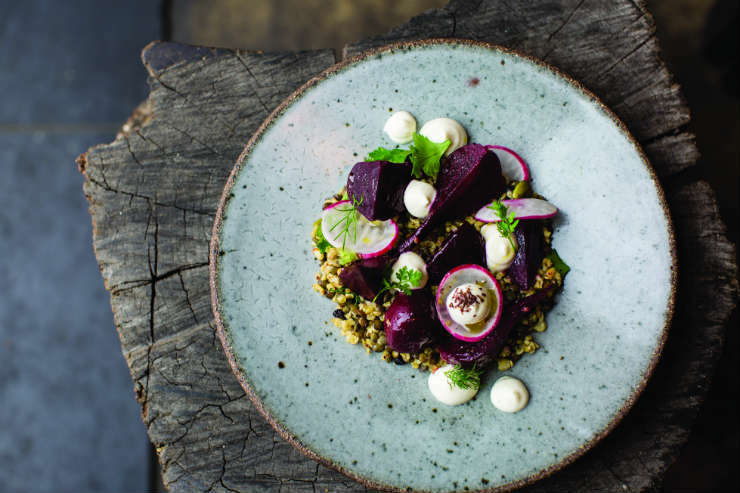 Despite the capital’s growing culinary credentials, last year the ACT (Australian Capital Territory) received only 243,000 international visitors – the least of any state or territory in the country. And walking around on a Saturday morning in autumn, it shows. My partner and I are the sole participants of a free, guided tour of the National Gallery of Australia (NGA), one of five run every day. On a Saturday morning in the Melbourne and Sydney equivalents, you’d struggle to elbow your way to a seat in the cafe, let alone access your own personal guide. While we eye the NGA’s star attraction – a multi-million dollar painting by Jackson Pollock – inquisitively, it’s the gallery’s lesser- publicised collections that prove the most interesting, colouring in the blank spots of our knowledge of Australia. 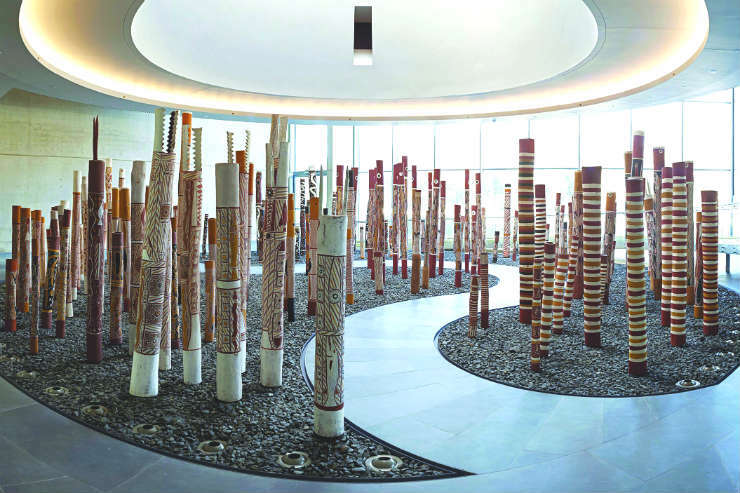 The resident Aboriginal and Torres Strait Islander art collection, for example, is the largest of its kind in the world. From the spooky canvas paintings of Wandjina (cloud and rain spirits from Aboriginal mythology) to the Aboriginal Memorial art installation – a collection of 200 hollow log co ns created by 43 Aboriginal artists – many of the works are beautiful and poignant. As we follow the path that winds between the clustered log co ns, our guide explains that each one represents a year of European occupation and stands as a memorial to all the indigenous people who lost their lives during the colonial occupation. For most visitors to Canberra, however, there’s no time for dithering over works of art as there are too many other attractions waiting, all free to visit – from Parliament House to the Australian War Memorial, the National Museum of Australia, the National Library of Australia, the National Portrait Gallery and more. While it’s unlikely that any client would earmark Canberra as their only Australian “must-see”, the city is an easy addition to a wider itinerary down under (a one-hour flight from Sydney and Melbourne or a four-hour train ride from Sydney). But if your clients are more comfortable on an organised tour, then operators such as Trafalgar and Saga o er escorted options that include Canberra. While the city remains well under the radar, statistics show ACT is one of Australia’s fastest-growing destinations. Last year it experienced a 17% increase in international visitors, the second-highest of any state or territory. Best to send your clients now, before word gets out. This 205-room hotel enjoys a prime position between bar and restaurant-filled Civic (the city centre) and Parkes, home to the majority of Canberra’s museums and galleries. With its own eateries and bars, the property is a one- stop-shop with enough pizazz for the Instagram generation. Interiors are lavishly decorated in rich tones, particularly in the restaurant, lobby and bar. Rooms receive a lighter touch: floor-to-ceiling windows lend a bright and airy feel, while a monochrome palette featuring red and yellow accents keeps design simple. The QT’s signature playful spirit is in evidence throughout – from the speakeasy hidden behind the hotel’s old-fashioned barber shop to the lobby wall, lined with photos of world leaders illuminated in neon. Rooms are a little on the small side and though the building is 15 storeys tall, the views from north-facing rooms are nothing to write home about, looking out over tra c interchanges and the low-rise city centre.